My beloved mother - Barbara Sophia - passed away suddenly from cancer in September 2013. It's a slow, but steady process to get used to that fact. And finding small daily ways to remember and acknowledge her feels essential and nurturing as I go about my busy days. One way I do this is to bake, especially during the winter holidays. It's become an essential part of celebrating light and love and togetherness during the darkest days of our year here in New York state. Barbara Sophia baked daily for her large extended Italian American family from the time she was in middle school, back in the late 1940's. There were cakes of all kinds, cookies and pies. At some point, this then-brand-new 1950 edition of Betty Crocker's Cookbook landed in her lap. She cooked from it for over 60 years. And now it's mine, exuberant grease stains, gaffer tape, and all! My husband, Michael, has a family tradition of cookie baking around the holidays. So each year, we make a list of the different types of cookie we want to make and send out to loved ones, crinkling in parchment paper. A tradition of my own started in high school is to bake a few batches of his favorite chocolate chip cookies for my father, Marke. And I almost always use this Betty Crocker recipe that I want to share with you today, with the tweaks that I learned from my mother. If holiday cookie baking is one of many many items on your to-do list this year, you might like to use the included Christmas planning sheets for baking in our downloadable Christmas Planner Bundle this year! We include a beautiful Baking Planner, Grocery List, Party Planner, and more. Sign up to receive the Christmas Planner Planner Bundle right in your inbox! Success! Your Holiday Gift Planner Bundle is on the way to your inbox. Important note: take 10 seconds and add "hello@enchantmints.com" to your email contacts. Otherwise, you may miss the gift winging its way to you! So, let's dive in to this best beloved chocolate chip cookie recipe! Cream together the butter and sugar until light and fluffy. Mix in the egg and vanilla. Stir the dry ingredient into the wet. Drop rounded teaspoonfuls about 2” apart on lightly greased baking sheet. Sprinkle a few grains of Maldon Salt on each one. Bake until delicately browned, about 8 to 10 minutes. Cookies should still be soft to the touch. Cool slightly and then remove from baking sheet. Focusing on what's important - quality time with loved ones - is one of the best ways of enjoying the holidays. There is so much to consume our time and our attention as we prepare for meals, gifts, recitals, and gatherings. And the exhaustion and frustration that can creep in can quickly extract the magic. 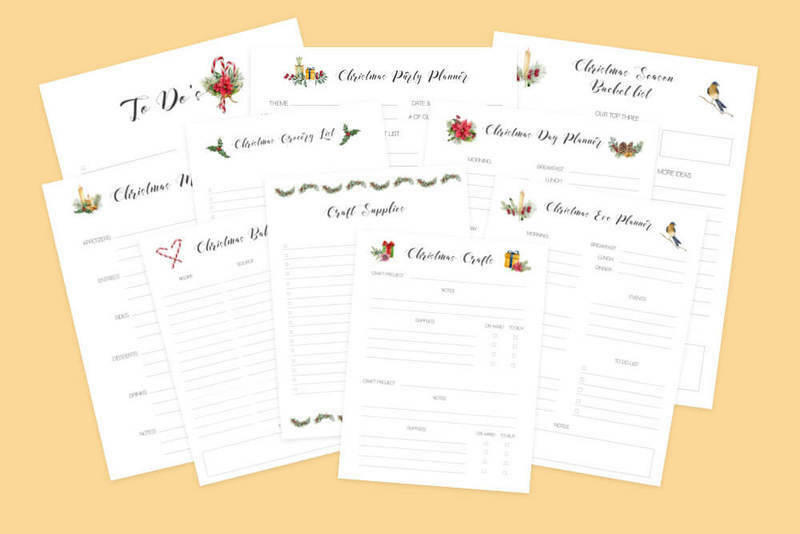 Our Christmas Holiday Planner Bundle has 11 beautiful printable planning sheets to help you prepare for, and then enjoy, the Christmas season. Success! Your Christmas Planner Bundle is on the way to your inbox. Important note: take 10 seconds and add "hello@enchantmints.com" to your email contacts. Otherwise, you may miss the gift winging its way to you! I'm using these planners this year to organize a full roster of holiday parties, choir pot lucks, and gatherings. I'm also using them to make sure I get some time making things with my hands and getting out to see things I haven't seen yet. Both of those help bring a whole bunch of happiness into the Christmas season! But first, a Christmas tree. Buying it is about to go on the to do list. That's all from us for now. But we'd love to hear from you! What are some of your favorite Christmas and Holiday baking traditions?